I’ve been working with Arogya World for over four years now, but I hadn’t made it to Chicago for our annual gala until this year—and I’m so glad I did! 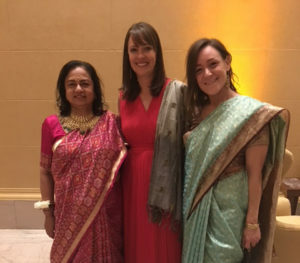 Donning a sari for the first time, I finally got to see first-hand what a warm, welcoming, and generous group of supporters Arogya has in Chicago. They are global citizens who see the potential of this small, but mighty non-profit to make a difference in the face of a looming, world-wide health crisis around chronic disease, particularly diabetes. Chronic diseases—like cancer, heart disease, and diabetes—cause 2 out of 3 deaths in the world, and 4 out of 5 in the developing world. The numbers regarding diabetes alone are alarming: globally, diabetes has nearly doubled since 1980. And India is a severe case; the country has 70 million people suffering from type 2 diabetes and an equal number at high risk. Anyone else would be intimidated by these numbers. The problem is too big, they would say. But not Dr. Nalini Saligram and not Arogya World. Nalini works tirelessly to change the course of chronic disease by creating evidence-based programs for women, children, employees, and families. I am constantly inspired by her energy and determination. When we were choosing photos for the gala book, we wanted to show happy faces because Arogya has a joyful message. And it does: in the face of these dire statistics, we know that these diseases—and these daunting numbers—are largely preventable. And Arogya is taking prevention programs to where people live, work, and learn in India—and now in the U.S. too. The Arogya team with dedicated Board members and a talented group of program managers in Bangalore and the US, has developed education and prevention programs—rooted in real science and rigorously tested for efficacy—for middle-aged school children, working adults, and families. We bring the facts about what diabetes is, and how preventable it is, to populations with the potential to influence others. Take school children. Middle-school aged children are the perfect age to not only understand the information—which our programs present in a fun, activity-based curriculum—but also to go home and share what they’ve learned with their families. The best part is that once they know the tools of prevention, no additional cost is really needed. It’s fairly simple: don’t smoke, eat more vegetables (and less sugar, salt, and processed foods), and get some exercise every day. And employees. How much time do we all spend at work? Our Healthy Workplaces program rewards employers who are implementing wellness programs—from smoking cessation to mediation classes to healthier cafeteria menus—and shares their best practices with other employers in India. And finally, families. Through mDiabetes, Arogya is pushing information about diabetes prevention out to participants through text messages. And MyThali, a meal planning tool, was created with women in mind—since women are largely the decisionmakers about a family’s health and diet. In Chicago, we celebrated the success of these programs—and raised around $200,000 to expand them. Our honoree for the evening, the Hans Foundation, has been an incredible partner by supporting us to implement and grow our work. The gala would not be possible without the support of sponsors Quinnox, the Cigna Foundation, Mesirow Financial, Aon, and Novartis. These leading companies have supported us year after year, which is a great testament to their confidence in our mission. Amid colorful Indian dress, wonderful wine and food, and entertainment by local global beat favorite Funkadesi, gala attendees bid on great prizes—trips, wine, art, and more—in a lively auction led by Gary Seybold of Ritchie Brothers. All proceeds will go toward supporting Arogya’s programs. The evening ended with a dance party led by the fun and energetic Funkadesi. Only then did my sari—which Nalini helped me into earlier in the night—start to unravel. All worth it for an incredible evening and a worthy cause! Interested in supporting Arogya’s work? Click here. Our gala program is available here.